Model 1404 SOLFRUNT Test Gauges are stem or low mount pressure gauges used for testing and validation, with an ASME B40.100 Grade 3A accuracy (±0.25%). The Model 1404 has a chemical resistant aluminum solid front case with a blow out back design. This pressure gauge has a mirrored dial and knife-edged micro-adjustable pointer to reduce parallax readings. The 1404 is available in both a 4-1/2” and 6” gauge sizes; the larger size provides better dial readability. The gauge has a low mount brass socket available in both a ¼” or ½” NPT connection, with a seamless phosphor bronze or beryllium cooper bourdon tube. Pressure ranges are from Vacuum to 5000 psi. The Model 1404 has a geared ARC-LOC movement to minimize friction and wear. 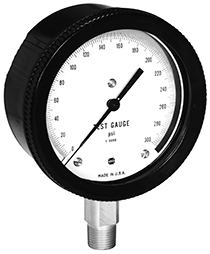 These gauges are available with a NIST Calibration Certificate option. Gauge size: 4½" or 6"
Order Code: CL - The wetted surfaces of the gauge are cleaned and tested to ASME B40.100 Level IV Cleanliness, capped and bagged to maintain cleanliness during shipment.